Grusomhetens Teater | Venus & Mars by Judith Malina. Venus & Mars by Judith Malina. The Living Theater was established by Julian Beck (1925-1985) and Judith Malina in 1947. This legendary New York based company is now led by the Co-Artistic Directors, Brad Burges and Thomas Scott Walker. The Living Theater’s social criticism and engagement combined with unconventional staging of poetic drama, and the frequent visits to Europe during youth protests led the company to gain very early worldwide interest. When Judith Malina passed away in 2015 she left behind the unfinished manuscript Venus and Mars, which Grusomhetens Teater is now going to premiere on the 14 th December 2017. The bond between the two companies is forged since 2011, through exchanging workshops and artistic strategies. A mutual trust, that was created not least due to the common contact with the tradition of the theatrical theorist Antonin Artaud (1896-1948), has made this staging possible. In addition to the veteran Thomas Scott Walker, the cast will include 12 actors from Grusomhetens Teater. Directed by Lars Øyno. 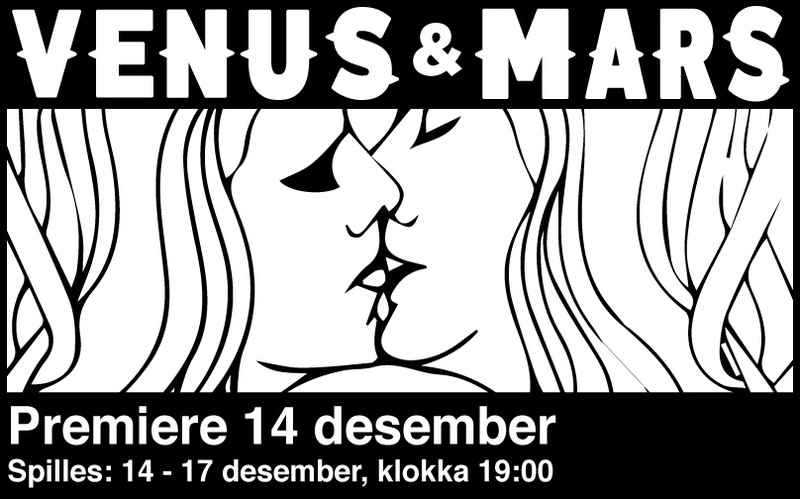 Venus and Mars will play from 14 – 17 December at 19:00. Reservations: billetter@grusomhetensteater.no/ 22203095 & at the entrance. 200/150,- kr.